Upper Kern – coming soon! Forks of the Kern – coming soon! When the weather warms up the water knob gets turned and the Lower Kern begins to flow. In regular years the season is from May through August. Isabella Lake is relatively shallow, which means that by the time outflow is underway, the water temperature is comfortable and not frigid. Top to bottom this river section is straight forward class II through IV, with one portage around a Class VI, the Royal Flush. There are a number of put-in and take out options, allowing you to choose varying mileage and difficulty. From top to bottom, the Lower Kern moves from Class II and into Class IV whitewater. Rapid ratings change with altering water flows. Unlike the majority of the Upper, the Lower Kern is a pool-drop river. The Lower Kern is raftable between flows of 650 and 6000 CFS. Commercially, the most popular Lower Kern trip is a Two Day. Kern River Outfitters has a camp that is situated nearly exactly halfway through the run, nicely breaking up both the mileage and whitewater (Video). Privately, the vast majority of users opt for shorters trips: One day or less. The numerous put-in and take-outs offer variety. The Jungle Run is a class II and III run that uses one of the higher upstream put-ins, such as Slippery Rock or Granite, and takes out at Miracle. The Miracle Run is the most popular section as it encompasses all of the Class IV whitewater and is of decent length, ending at the final take out at Democrat. Finally, the Big Five is a fast trip starting at Delonegha Bridge and taking out at Democrat, nailing five Class IV rapids in quick succession. As an added bonus, it starts below the Royal Flush, eliminating a portage. The Lower Kern is an intermediate to advanced river run. While there are sections that are mellow Class II and III, take into account numerous other challenges such as strainers, and sieves. As a private boater, make sure you join a party that has recent Lower Kern experience. Royal Flush is a Class VI rapid located at mile 12.73. The portage is on River Right. There is a small sign alerting you to the portage just upriver of it on the right bank. The portage is easy and doesn’t take much time at all. A Kern River Use Permit is required year round for each craft (kayak, raft, etc). These are free of charge. Learn more here. 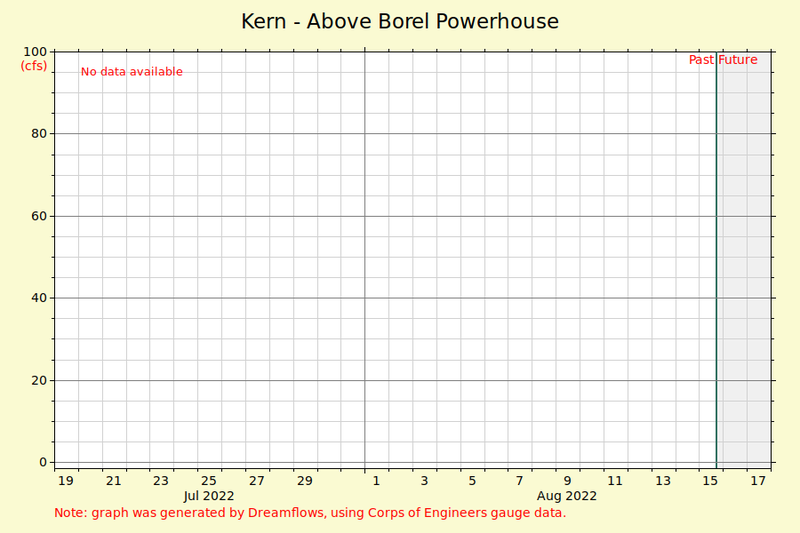 The entire Lower Kern is raftable from 650 To 6,000 CFS. The Jungle Run can be ran lower than that though. Low water is 650 – 1000 CFS. Medium flows are 1000 – 2500 CFS. High flows are above 2500 CFS. Above 3,500 CFS you should be seeing the river often and be well experienced or go with a commercial outfitter. The guide below outlines the three most common runs in consecutive order beginning with the Jungle Run, then Miracle, and finally the Big Five. To get the most value out of this guide, it’s best to open up the map in a second tab (by clicking the dotted square in the right-hand corner of the map) and referencing it as you go through the written guide. GPS: All data points were collected using GPS. This location information is provided. These locations were checked against Google Earth for accuracy. Distances are the averages of repeated trips that were GPSed. Access points: Put-ins and take-outs include links to their Google Map locations. Use this to accurately build shuttle directions. Additional information: Some rapids or point of interests include a Learn More link. Opening this link will provide additional details such as rapid photos, videos, GPS coordinates, and other relevant information. If there is no additional information link, then the GPS coordinates are provided. Class II rapid or river feature. Class III rapid or river feature. Class IV rapid or river feature. Used only at The Royal Flush. The most commonly used access points. These include hot springs, notable private property and more. Indicates well known surf waves and jump rock locations. Click the square on the right to see the map in full size! The Jungle Run is a Class II and III run from the higher put-ins such as Slippery Rock or Granite and winds its way through the canyon to either Sandy Flat or Miracle as the takeout. WARNING: Conditions change frequently and may make this guide useless. This guide is NOT a replacement for sound judgment. Go with someone with recent Lower Kern experience. Slippery Rock to Miracle is 8 miles. Slippery Rock to Miracle is 28 minutes round trip. Google Map directions. Mile 0.0 – Slippery Rock Put-in: This is the most upstream put-in available on the Lower Kern River. Located just downstream of the Lake Isabella Dam on River Right. Mile 0.05 – Slippery Rock Island: The river splits around an island immediately below the put-in. Stay to the left. Mile 1.47 – Wallow Rock Rapid: Class III. At flows above 2000, this rapid is pretty insignificant. Below 2000 there is a huge boulder in the middle of the river with a small channel on either side. There are a couple of guard rocks on both sides that require a precise move to navigate through. Be careful as the middle boulder has been known to flip 14’ paddleboats. Mile 2.1 – Granite Launch Put-In: Located on River Left, this put-in is just off of Highway 178. Mile 2.7 – BLM Put-In B: Located on River Right is BLM B. This put-in is accessed by taking the road to Keysville and following the raft launch signs. This is a public access area and can get congested with day visitors. This is a day use area only, no overnight parking. Mile 3.23 – It’s a Dilly Rapid: Class III. Long, and fun rapid. Make your way to River Right to avoid the bottom hole that is big at medium to high flows that’s located left and center. Mile 3.60 – Private Property: River Left. A private beach with a home and barbeque area is located here. Mile 3.63 – Oscar’s Nightmare Rapid: Class III. The river splits into two channels here. At higher flows, take the left channel as a skirt line. At medium and lower flows, you have to make the move around the large rock island by taking the right channel. Mile 3.63 to Mile 6.27: Class II / III- read and run. The next three miles is read and run whitewater that’s Class II and Class III. Mile 6.27 – Black Gulch Day Use: A sandy beach located river left that is open for day use and dispersed overnight camping. Accessible by dirt road from the 178. Mile 6.79 – Borel Power House: Now defunct powerhouse that’s owned by Southern California Edison. Learn More – Detailed Description, GPS, Photos, History. Mile 7.18 – Sandy Flat Campground: Sandy Flat Campground offers 32 camping sites. Water, and vault toilets are available here. Mile 7.18 – Sandy Flat Put-In / Take Out: This access point can occasionally get crowded with people swimming in this popular eddy. Mile 7.45 – Jump Rock: River Left. Towards the end of this long pool, look River Left for a pile of granite boulders. Park your rafts just past these. This jump rock has slower moving current at lower flows. Mile 7.88 – Hobo Campground: A campground located on River Left alongside and near Hobo rapid. There was once a hotel, store and post office located here. Learn More – Detailed Description, GPS, Photos, History, Booking Information. Mile 7.88 – Hobo Rapid: Class III. Hobo rapid was the site of a slalom kayak training course for the Olympics. No longer used but cables still run several feet above the high water line. Stay inside the first bend to avoid the pourover and then lookout for the larger holes and boulders. Learn More – Detailed Description, GPS, Videos, Photos, Videos. Mile 8.19 – Miracle Put-In / Take Out: If you are using this as a take-out, be sure to catch the eddy on River Left at the bottom of Hobo Rapid. This is the last take-out before getting to the Class IV stretch of the river. It is very hard to pull a boat back upstream if you miss this. Miracle Run – Class II, III & IV. Portage Required. Miracle is the most popular private trip on the Lower Kern as it tackles all the Class IV whitewater available and can be done in a single day. A portage is required at The Royal Flush. Keep in mind that technically this run is all the way to Democrat, however there is an option to takeout upstream at Delonegha Bridge, which is the Big Five Put-In. Miracle to Democrat is 11 miles. Miracle to Democrat is 42 minutes round trip. Google Map directions. Mile 8.19 – Miracle Put-In / Take Out: Drive into the Miracle / Hobo turn off from the Old Canyon Road and make a left. Go downstream as far as you can and this will take you to the put-in. Mile 8.23 – Miracle Hotsprings: Point of interest. Located on River Left is Miracle Hot Springs. These hot springs can be accessed from the road/miracle campground. Be sure to rinse off before entering the springs as sand and dirt will accumulate in the pools. Mile 8.34 – Miracle Rapid: Class III. A simple, splashy left turn with a hole at the bottom of the turn on river right. Mile 9.35 – Arnie’s Armpit Rapid: Class III. This rapid features a tree island that splits the river. Carefully finesse your way through avoiding the trees. Mile 9.46 – Remington Hotsprings: Point of interest. On River Left are a set of hot springs with concreted pools. The Old Kern Canyon Road can access these. There is a parking lot at the top of the canyon and primitive campsites available around this area. Please be courteous to others. Be sure to rinse off before entering the pools. Mile 9.89 – White Maiden’s Walkway Rapid: Class IV. The scout of this rapid is on River Left in two small eddies. Enter just right of center and fight to stay river center in order to thread the goalpost between two large holes at the bottom. Be sure not to go River Right into boat flipping rock eddies and watch for sneaker holes as you set up for the goalposts. Mile 10.29 – Sun Up Rapid: Class II. Read and run. You can enter left or right. Look out for the boulders in the middle of the river. Mile 10.36 – Sun Down Falls Rapid: Class IV. The scout is on river right. The 8 ft drop at the bottom of this rapid is what makes it so spectacular. At high water, you are punching through waves and riding a thin tongue of water between two large holes that block both sides of the river. At low water the drop at the end of the rapid becomes more pronounced. Mile 10.57 – Silver Staircase Rapid: Class III / IV. Immediately following Sundown, this is a long read and run rapid. At the top start center moving to the left. Once you pass the large pour over in the center, work back right. At flows below 3000, there is a nice surf hole at the bottom of the rapid. Catch the eddy on river right and work upstream along the right bank to hang ten. Mile 10.9 – Raft Surf Wave: On River Right a fun surf wave for rafts opens up at low to medium flows at the very bottom of Silver Stair Case Rapid. Mile 10.99 – Buffalo Rock: Point of interest. On River Left at the top of the canyon is a large boulder teetering on the cliff side. Look closely and you can see a buffalo grazing. This is the start of Buffalo Canyon. Learn more – Detailed Description, GPS, Photos. Mile 11.1 – Buffalo Run Rapid: Class III. The main feature to look out for is the large pour over in the middle of the river. You can easily run right of this feature. At certain flows, this is a great hit to take but can flip a boat if you don’t hit it straight. Mile 11.67 – Powerful Possum Rapid: Class IV. This rapid washes out at high flows, and picks up more teeth as the water levels come down. There’s a large pool upstream of it allowing an easy scout on River Left. Mile 11.85 – Turkey Hole: Class II. There is a hydraulic in the middle / right of center of the river that makes for a steep (flippy) surf hole at flows above 3500 CFS. Easily avoided on River Left. Mile 12.13 – Good Morning Eddy: Point of interest. This is a decent sized eddy on River Right. This is a good place to talk about False Flush, Portage and Royal Flush to make sure everyone is aware that they are approaching. Mile 12.35 – Your Guide’s an Idiot Rapid / Frank Lost His Pants: Class II / III. There is a small hole in center of the river that is run right. This small hole has a lateral feature that can easily rip paddlers from the boat, and possibly your shorts too. Mile 12.6 – False Flush Rapid: Class III / IV. Be careful in this rapid as there is a mandatory portage just downstream on River Right. Enter this rapid on River Left, avoiding the large hole in the center of the river. There is a large flat rock on River Left that you will need to avoid as the water pushes up against it. This rock has been known to flip boats. Once you avoid the rock T up to the drop at the bottom. At flows above 4000 CFS, some commercial rafting companies will hike their guests around this rapid all the way to the Royal Flush. The trail for this is on River Right. Mile 12.73 – Portage: River Right. There is a sign on River Right just below False Flush rapid alerting you to the portage. Utmost care is required here as the portage eddy is small and can only fit a few rafts at a time. Mile 12.73 – Royal Flush Rapid: Class VI. Recommended portage. All commercial outfitters are required to portage this rapid. The portage is on River Right. Mile 13.38 Razor Rock Rapid: Class II. This rapid is pretty benign until the river gets below 1000 CFS. At lower flows, it’s a short drop that’s known to flip boats. At flows below 800 CFS you might want to consider portaging by parking your boat on the large flat rock in the middle of the river and pulling it over the top. Be aware that if you run this chute and try to low side through the opening, you will probably flip. The water is very quick to grab your tube. Mile 13.59 – Taco Stand Rapid: Class III. Read and run rapid that requires more finesse as the water drops. Mile 14.17 – Fish Trap Rapid: Class III. Read and run rapid. Enter river center and enjoy the wave train while being sure not to get pushed left into the rocks. Mile 14.43 – Private Property Delonegha Hotsprings: Point of interest. River Right. There are structures here and cemented pools. The presumed owners of the property are often here. Mile 14.84 – Delonegha Rapid: Class III. Read and run rapid with fun punchable holes and a gentle right hand turn. Mile 15.01 – Delonegha Bridge – Big Five Put-In: Point of interest. This can be used as both a put in or take out if you are not looking to run the entire Lower Kern. The Big Five is the final portion of the Miracle Run. Many boaters that are looking to catch an afternoon lap prefer to put-in here and run the Class IV below as there is no portage required and it is a relatively fast trip. Delonegha to Democrat is 4 miles. The Big Five is 35 Feet per Mile. Big Five to Democrat is 14 minutes round trip. Google Map directions. Mile 15.01 – Delonegha Bridge – Big Five Put-In: Point of interest. This is a day use area and the put-in for the Big Five. Learn More – GPS, Detailed Description, Photos. Mile 15.74 – Surprise Rapid: Class III / IV. This rapid is known for its exposed rock at the very bottom that can easily flip a boat at the right flows. Be sure to enter center and work your way left to avoid the rock. Learn More – Detailed Description, GPS, Videos. Mile 16.18 – Hari Kari Rapid: Class IV. Hari Kari is a sharp right-hand turn around a rock peninsula. At lower flows, the entrance is bony and requires precision between rocks. At medium and higher flows there is a lateral River Left as you make the turn and a hole river center after you have rounded the bend. Learn More – Detailed Description, GPS, Videos, Photos. Mile 16.45 – Horseshoe Falls Rapid: Class IV. A long class IV rapid with a River Right entrance and the main feature being a large hole river center at the bottom. The water immediately funnels into a wall marking the end of the rapid. Mile 16.58 – Jump Rock: Point of interest. River Left. Immediately after Horseshoe, there is a nice eddy to regroup and take a break. The jump rock is on the upstream side of the eddy. Mile 16.97 – Sidewinder Rapid, Part A: Class IV. This rapid is also well known as Eat Rocks and Bleed. Read and run the small holes and exposed rocks and go either left or right of the tree island continuing to read and run as you work right to set up for Part B. Learn More – Detailed Description, GPS. Mile 17.11 – Sidewinder Rapid, Part B: Class IV. This rapid is also well known as Eat Rocks and Bleed. Enter as far right as possible and continue to work hard right through the entire curve in order to avoid the boat flipping rock pile and strong eddy on River Left. Learn More – GPS, Videos, Detailed Description. Mile 18.03 – China Garden: Point of interest. River Left. Now closed. This was a camping and day use area. Mile 18.36 – Private Property: Point of interest. River Left. There is an abandoned building here and various sheds. The road connects with the China Garden pullout at the top of the canyon. Mile 18.79 – Pinball Rapid: Class IV. There is an eddy River Left before the rapid for a recommended scout. Enter river center and work your way through the rock garden and exit River Right or Left depending on flows. Your biggest concern is the entrance and some of the holes towards the bottom. Mile 18.93 – Pinball Island: Point of interest. There is a small island immediately below Pinball Rapid. At all flows, the left side is open. At higher flows, the rightside becomes accessible as well. Mile 19.05 – Democrat Island: Point of interest. Go Left of the island or you may miss takeout. This is a different island than the one that is at the bottom of Pinball Rapid. Mile 19.24 – Democrat Takeout: Point of interest. The takeout has signs warning of the downstream dam and is hard to miss along with 2 different ramps about 100 yards apart. Learn more – Detailed Description, GPS, History. To provide the most comprehensive resource for river rafting the Kern.